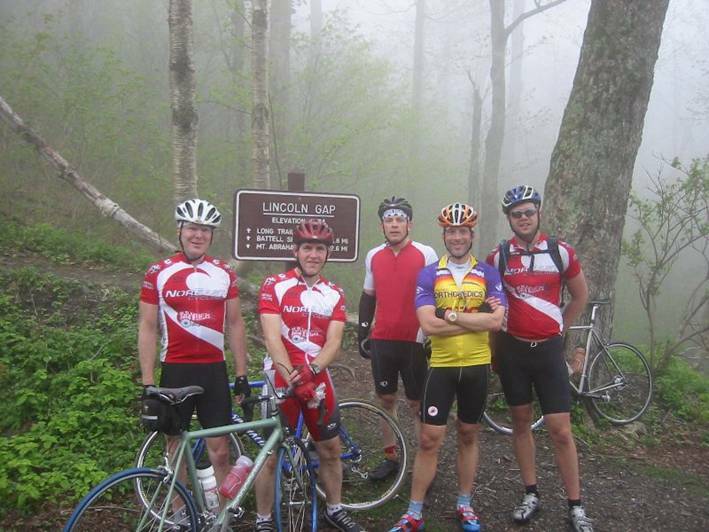 · Riders cleaning Lincoln Gap: four, the rider with the biggest low ratio (30x25) walking... again. Smaller ratio next year? After getting “burned” last year attempting 6-gaps on June 25 in 100+ degree heat index temps, a few of us decided to try earlier in the season to beat the heat. We also wanted get some training value out of the ride, hitting the hills a little harder and maintaining a firmer pace on the flats. None of us had any important races planned for this or the following weekend, so taking a couple extra days to recover from an effort like this was not going to be a problem. We started from our usually spot at the junction of Rts 73 and 100 just south of Rochester. Forecast was for a high around 70, rain ending in the morning, clearing by afternoon. Weather look perfect rolling out after 9am. Climbing Brandon Gap wasn’t too rough. We stuck together pretty much. Coming down towards Brandon on the other side, we noticed the skies didn’t look so nice. Dark gray, roads still damp, and bits of drizzle were in the air. We worked our way around scenic Dunmore Lake to the base of Middlebury Gap. Middlebury gains much more vertical and begins steeply, moderating some, then finishing steeply. Half way up Dave and I went for the town line sign, but my chain dropped. Argh! No waiting at the top. Those who crested first bombed right over on down to Hancock, our first stop to replenish fluids and munch a Pop Tart or two. After a brief stop, we headed north on Rt 100 through Granville Gulf, a baby gap of sorts that gains about 500ft. Due to extreme rainfall a couple weeks earlier, the streams were still running fast and the waterfall there was quite something to see. But we didn’t stop to sight see. Lincoln Gap came up awfully quick, and I was already starting to feel my legs. Brett was running a lower ratio this year, and I had a hunch he had an ambitious pace in mind for this beast after being demoralized by it last year. We stopped for a quick derailleur adjustment on Brett’s bike at the bottom, with Jason getting a small lead start. After cresting the initial steep paved section, we could see from the flatter gravel section that the ridgeline before us was completely socked in with clouds. I thought for sure we were heading into rain, and that was really bad news on the other side where the descent was mostly on gravel. I stopped briefly to shoot a couple pictures, then had to catch up to Brett, Glen, and Dave. I caught them as we begun the paved wall portion of the ascent. As suspected, Brett set the pace on this one. I had not planned on going so hard, as 7+ hours in the saddle is a long ride. We reached the cloud line, and visibility went down to about 100ft. I was dying. Every time I do this climb, I get fooled by how long the 20-24% grade suffering lasts, about 15 minutes worth. Brett and I reached the top together ahead of the others. His PowerTap said he was pushing 380-400 Watts at 4-5mph! A hiker couple drove up the way we came and parked. They asked if we were waiting for our friend. 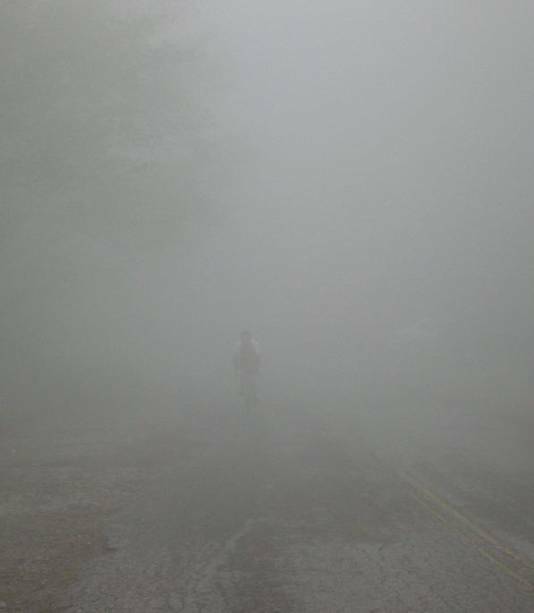 The gal sympathetically said he was walking his bike. Jason ran the same gears as last year, a stock triple, and achieved the same result. Dave cresting the top of Lincoln Gap. It really was that thick at times. It was very cold and breezy on Lincoln Gap, so we didn’t hang around long. The descent is one to be careful on. It is steep, bumpy, and curvy. You can’t carry any speed on the first paved portion. Bigger riders must be very mindful of over heating their rims. Like usual, this descent separated the mountain bikers from pure roadies. The pavement gives way to gravel, which was in excellent condition this time. Dave and I carried speeds near 40mph much of the way down. Once getting back on pavement near Lincoln center, we waited quite a while for the others to show. Quite the adrenaline rush. 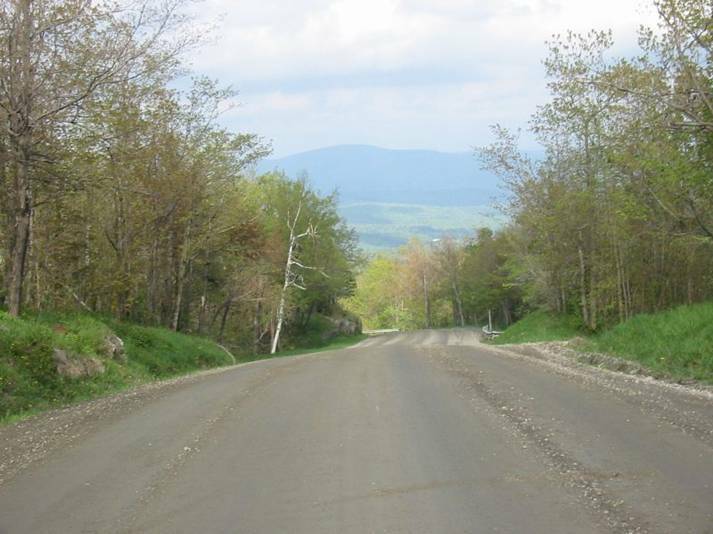 I called the Lincoln Town Clerk earlier in the week to learn the status of Lincoln Gap Rd. She checked with the road crew via radio and reported it was graded on Tuesday. That combined with rain on Thursday and Friday made for ideal dirt road conditions. The clerk also advised me that that town was having their annual town-wide yard sale that day. I didn’t think it was a big deal then, but as we came into town, there were probably hundreds of people milling about. We had yard sale laden trucks pass us at unreasonable speed and proximity too. Anyway, the general store in town had some soup and goulash type stuff going on, and it looked and smelled a whole lot better than more Pop Tarts. We all got some, a whole bowl for me along with chocolate milk. Now I generally tolerate food in gut quite well while cycling hard. But eating so much that I felt full was a big mistake minutes away from climbing Appalachian Gap. I was so full that my breathing was restricted. No nausea or anything like that, just a simple physical space discomfort problem, food in gut displacing volume needed for breathing. We climbed baby App together, recovered some on the brief descent, then hit the serious part of Appalachian Gap hard. Brett set the pace again, and I was suffering staying with him. 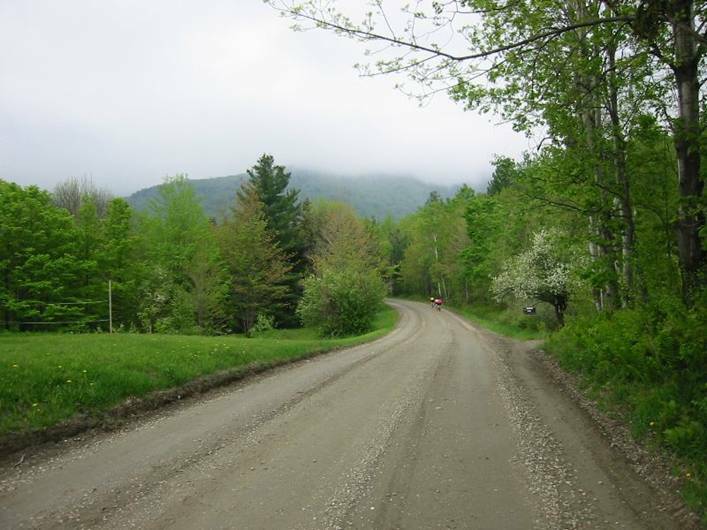 This being the finishing climb of the road stage of the Green Mountain Stage Race, I anticipated a sprint finish to the top. Now we couldn’t tell exactly when the top was coming, because the top was socked in with clouds. When we passed that sign on the left telling trucks to use low gear (which I knew was at the top), I started to take off. Brett didn’t want to challenge me on this one. I was glad. I could have lost my hamburger helper that was so good 40 minutes earlier. Just like on adjacent Lincoln Gap, it was very cold and breezy on App Gap. No view, which is too bad, as App Gap offers the best view of all the gaps. We quickly rocketed down to Waitsfield, where we made another brief food stop (none for me) before heading off to Roxbury Gap. We were all starting to hurt at this point, with about 100 miles and 10,000 feet in our legs. 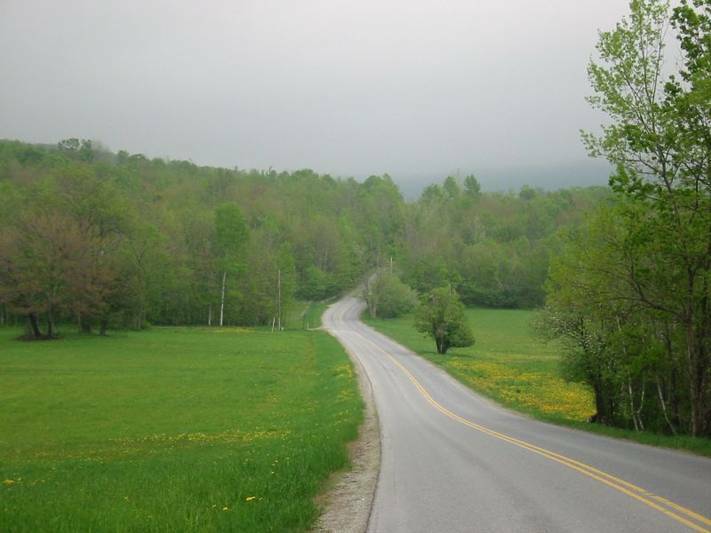 Roxbury Gap begins as moderate climbing from the town of Warren. We stuck together, our pace reasonable. The foolish carbo load I did in Lincoln was now well on it’s way to the next stage of processing, so I was feeling much better, good even, like just what I needed. As we made the right hand turn onto Roxbury Gap Rd, the grade and pace picks up. Now Brett is setting the pace again, and I’m thinking to myself if I sit back a little bit, that maybe he’ll throttle back just a bit. You can’t get next to Brett without the pace picking up 30%. I was starting to hurt and was thinking I didn’t want to take a week to recover from this ride. But wouldn’t you know it, Dave pulls up next to Brett and matches pace, the 30% picked up pace. Argh! Of course, I can’t just let them ride away from me. Nobody waited at the top of Roxbury Gap. I stopped briefly to shoot a couple pictures then descended by myself. Dirt here too was near perfect. No loose stuff, but a bit bumpy. Top of Roxbury Gap looking east. Well packed gravel all the way down. We regrouped in Roxbury, making one last brief hydration stop. We had a long haul down Rts 12A and 12 to the final gap, maybe 20-25 miles of flat to slightly downhill grade. We had tail wind too. 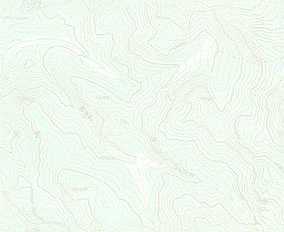 I don’t know what the deal was, but I was dying on this flat stuff. Brett was too. Dave and Glen were setting the pace here, each taking monster pulls. Glen has bailed me out on a prior 6-gaps ride on this part. We maintained good pace here, seldom under 23mph, sometimes close to 30mph. We fly through Randolph without stopping, bearing right on Rt 12 south. After five miles or so on this with some more downhill bias, we pick up Camp Brook Rd, which goes over Rochester Gap. The climb begins modestly, but the last two miles is quite steep, maybe 10% grade. And with 125 miles and 13,000ft in your legs, most of us were in limp mode at this point. Dave was clearly setting the pace here. Brett was doing a good job staying with him, and I was in trouble. I thought I was riding a steady pace, yet I would catch them, lose them, catch them, lose them. As we crest the top of Rochester Gap, Dave just rolls away from us like he was toying with us the whole time. What was up with that? Jason and Glen crested a couple minutes later and took a wrong turn part way down. This added a couple miles to their ride. So we all got back to the cars in Rochester near the same time. Brett and I had a riding time of approximately 7 hours, 34 minutes. This does not include the food stops, totaling maybe an hour. My previous best riding time for 6-gaps was 8:11. The weather, although not picture perfect, turned out to be near ideal for a hard paced 6-gaps ride. Any warmer, and we would have had more hydration/electrolyte/cramping problems. Any colder, we would have needed extra layers along on the ride. This was Dave’s first time riding 6-gaps. It was Jason’s and Brett’s first successful completion of the ride after aborting in heat last year. Glen and I are 6-gaps veterans now. We all thoroughly enjoyed the ride.